Suddenly it’s become very popular to say you’re going on a data fast. Indeed, recently there’s been a lot of chatter in the marketing universe that - much like the low tech, sales-people-intensive ad networks of yesterday - third-party data has outlived its usefulness, and is on its way out. 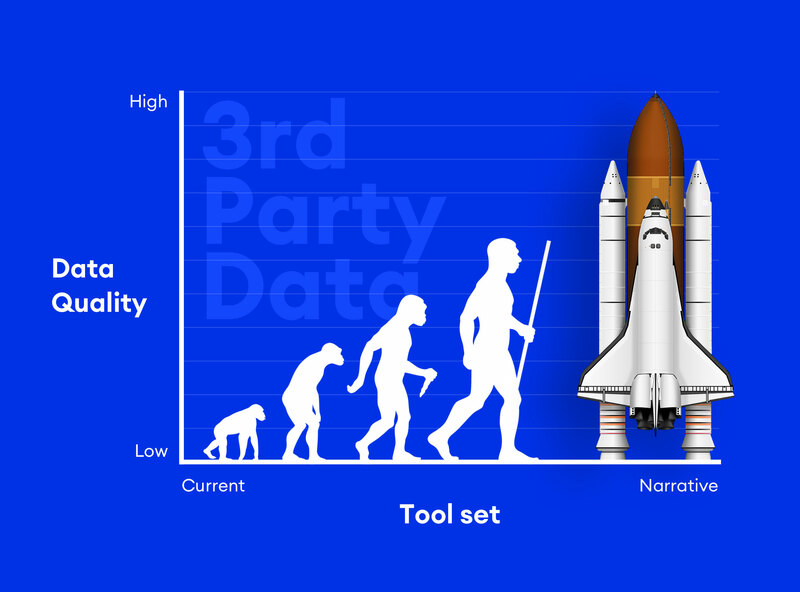 Take the recent AdExchanger post “Third-Party Data Is A Bad Habit We Need To Kick.” There are lots of folks saying that we all need to pull back on data we don’t own. We must respectfully disagree with this sentiment. The thing is, this isn’t the first we’ve been hearing about this idea. In a post GDPR world, where everybody wants to be a direct-to-consumer brand and first-party data is seen as pure gold, third-party data has gained a reputation as being unreliable and not worth the trouble. While we agree that the way that third-party data has been transacted to date has been deeply flawed - we actually think the opposite is true. In reality, third-party data is an untapped and undervalued resource. And its usage is about to explode. In 2019 many companies complain publicly that it feels like they are swimming in data - yet most data scientists and marketing scientists inside these firms will tell you they don’t nearly have enough. They just don’t have a great way of getting access to what they really need. Meanwhile, companies that produce valuable consumer data - data that could command high prices and deliver powerful results among the right sets of customers - don’t have an easy or efficient way to package it and license. What we are left with are third-party data sets that aren’t tailored to buyers and thus are ineffective. We are utterly convinced this is all about to radically change. In Timmers’ post, she talks about how data companies often get individuals’ basic information wrong (like which gender a person is). That’s very true. That part we completely agree with actually. The problem is too many folks in the industry are thinking about how third-party data has worked historically. Not what is and can be. They are throwing the baby out with the bath water. Yes, pre-packaged data segments are frequently useless and we wouldn’t suggest anyone use data that provides no signal. Our challenge with the thesis is that the fact that the data comes from an external data source is not, in itself, why it doesn’t work. If the value of data is inherent in its ability to provide precise information - to market to prospective customers, serve existing ones, and so on – it won’t have any value if the information it encodes isn’t precise, as in the case of many third-party segments. What that logic misses is that data need not be pre-packaged and thus generic. Clearly, it can also be accurate. We would argue that the challenge with third-party data is in how it has been packaged and sold up to this point. Middle-men creating well named, but often useless sets of users with no insight or incentive structure to make sure those users match the name and/or create any value. That’s a lot like buying ads on random ad networks in 2019. Instead, we think the business of buying and selling data is about to undergo the same kind of transformation that digital advertising did when it shifted from RFP buying and selling to using automated software. There’s another reason that data transactions have been dissatisfying for many until recently. Besides not exactly being able to get the data that you wanted - buyers often didn’t even really have visibility into what data they were acquiring or where it came from. The more that data acquisition becomes associated with mystery, the less desirable it became for marketers. It’s just too risky. Technology is changing those conditions quickly. Buyers are now able to see what data they are acquiring before they make a decision on whether to acquire it. As data play such a crucial role in so many of an organization’s decisions, the more they are able to know about where it comes from, the more confident buyers will become in data’s power overall. Transparency also has downstream benefits beyond data quality. In a world where the regulatory environment around data has become more rigorous, transparency allows organizations to ensure GDPR compliance by shining a light on the source of the data, their consent frameworks, collection methodologies, and privacy policies. Like programmatic advertising, you’ll be able to get your hands on the specific data you want, from dozens, hundreds, if not thousands of sources - whenever you need out. We’re already seeing it on our platform, where a new data economy is thriving as sellers unlock new revenues streams while companies can automatically complement their own data with highly relevant and useful third-party data. We think this is only going to accelerate. Again, if you ask the people inside companies who live and breath and touch data on a daily basis - none of them have enough. In the future, to be competitive, everyone is going to be in the business of buying or selling data. And the death of third-party data will be nothing but a myth.